They have soft, thick fur that is reddish/brown in colour tipped with white. Their underside is white and brown markings can be found on their flanks and belly. Their head is broad and flat and they have very small ears that are set low on the sides of their skull. Their eyes are large, they have short legs and a short, thick tail. The toes of the Flat-Headed Cat are partly webbed and their claws do not fully retract. All of their teeth are sharp which assists them in holding onto the fish that they capture. Flat-Headed Cats are adapted to a semi-aquatic lifestyle and captive cats have shown they are comfortable in and around water. 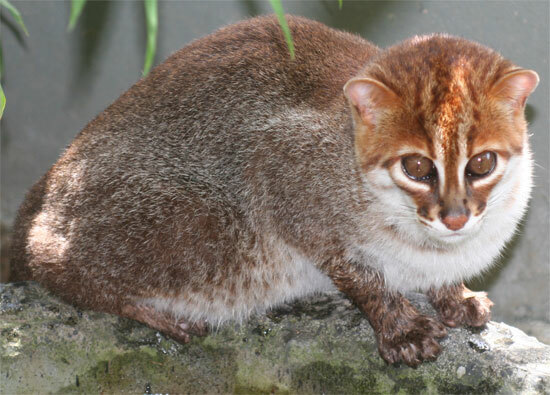 Flat-Headed Cats are found in the tropical forests of south east Asia at altitudes up to 700 m (2,300 ft). They are nocturnal and they are usually close to bodies of water. Flat-Headed Cats mainly feed on fish, crustaceans, frogs, rodents and small birds. Little is known about reproduction in Flat-Headed Cats. It is believed that the gestation period is approximately 56 days after which 1 - 4 kittens are born. There is no recorded data on predators of Flat-Headed Cats. There are no subspecies of the Flat-Headed Cat. Flat-Headed Cats are one of only four cats that cannot retract their claws, the others being the cheetah, fishing cat and iriomote cat. 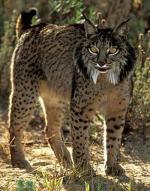 It is estimated that the population of Flat-Headed Cats is less than 10,000 individuals.